I'm looking forward to the 47th consecutive win on February 25. Congratulations to Coach Thomasson and all the Tigers. Ex-Stockton Mayor One Step from Foreclosure? I would not be surprised to see this story get picked up nationally. On one hand, I expect public leaders to act more selflessly than the average person, so I find this story disapointing. I understand why it is so upsetting. On the other hand, it doesn't help the situation to get angry at people who "walk away" from underwater mortgages. We have to recognize the incentives and expect people to act in their own best interest. When that isn't in the community's best interests, we need to fix the financial incentives. The only way to fix the default incentive is to facillitate loan principal write-downs for owner-occupants who will continue living in the house (Chavez wouldn't qualify since he moved away. Foreclosure should proceed here if there is no short sale). Making that happen in a way that is fair and cost-effective is difficult. I think shared-appreciation mortgages (where homeonwers who have principal written down share any future gains from sale with their lenders or taxpayers) offer the best chance for this. There have been a lot of stories lately about how the drought and Delta pumping restrictions are impacting the Valley economy. This story got national coverage and is typical. First, what happened in 2008? The story notes "Last year, federal water deliveries were just 40 percent of the normal allocations, fallowing hundreds of thousands of acres." I have seen other quotes about how the Delta pumping restrictions cost thousands of jobs this year. While, I have no doubt that this caused layoffs and fallowed fields on some farms - I don't believe the net impact on farms was that large. In fact, the latest employment data tells a different story. CA EDD reports that farm jobs were up by 4,000 statewide in 2008 vs. 2007 and 15,000 compared to 2006. In fact, of the 11 main sectors of the economy tracked by EDD, farms were #2 in job growth in 2008, trailing only education and healthcare. Even in South Valley counties, farm jobs are consistently higher now than they were a year ago. The agriculture sector has been expanding rapidly in recent years due to strong prices and revenues, and it is probably true that water issues limited 2008 growth over what it would have been. Likewise, weak agricultural prices in 2009 would shrink the farm sector this year even with full water allocations, but I expect water and Delta environmental concerns will get most of the blame. 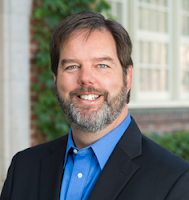 I think we are definitely looking at significant losses in farm employment this year in the Valley, but will it be as bad as the 40-60,000 lost jobs being predicted by Richard Howitt, chair of the Agricultural Economics department at UC-Davis? I don't know, Howitt's studies always seem to have pretty large multipliers compared to other farming impact studies. I have a hard time seeing an estimated $1 billion in lost farm revenue creating that level of unemployment. My initial guess is that 20,000 lost jobs is more likely, still a substantial loss on top of an already painful recession. If markets stay depressed, the losses could be even higher but that would be due to the global recession not water restrictions. California unemployment pops from 8.4% to 9.3% in one month. Stunning. Last month, I compared our peak unemployment forecast (9.6%) to UCLA's (8.7%), and said we would check back in a year. Instead, let's check back now, because at this rate our forecast could be looking very low in the rear view mirror too. At least we made it a month. The big story this month is retail. The holiday hiring surge that wasn't. Typically, retailers across the state add about 100,000 workers in November and December, and shed about 100,000 employees in January after the holidays. This holiday season, California retailers added less than 40,000 jobs, causing a big decline in "seasonally adjusted" retail employment. It will be interesting to see if the seasonal retail layoffs in January are less than expected, leading to a "seasonally adjusted" increase in retail jobs in the January report. Given the store closings and retail bankruptcies in the news, many of these retail job losses are undoubtedly permanent and we will likely see retail job losses in excess of 50,000 in the January report but probably less than the usual 100,000 decline seen after a typical holiday surge. With all the talk about 2 day per month state worker furloughs that amount to about a 10% pay cut, it is a good time to look at state government salaries in California. According to the Bureau of Labor Statistics, the average weekly wage for state government workers in California was $1092, compared to $863 per week for state workers in the U.S. as a whole (about $830 if you took CA out of the total and compared it to the other 49 states). So, the avg. state worker salary in CA is 26.5% higher than the U.S. avg. for state workers. You could argue that all wages are higher in CA and the difference just reflects that. The BLS data shows that for all workers, the average weekly wage in CA is $960 and the US avg is $855. Considering all workers, weekly wages in CA are about 12.2% above the U.S. So, California government employees have a significantly larger wage difference than the private sector. There are other studies that show the number of state workers per capita and overall staffing levels are not that high in California. Taxes as a share of income are a little higher than the U.S. average. It won't settle the current state budget mess, but taken together this all suggests that it is reasonable for CA taxpayers to expect some salary concessions from state government workers in both the short-term and long-term. This isn't to say that all state workers have high salaries compared to other states. These are averages, and it is my understanding (although I don't have the numbers) that salaries are very high paid in certain areas/agencies and not in others. The gap is similar in local government. Local government workers in California average 26.7% higher weekly wages than their counterparts in the U.S. Initial estimates of how the stimulus might split up aid to state government. Here is a table. I was thinking CA would get about $20 billion for the non-infrastructure piece, but it looks like the total will be less than $21 billion inclusive of infrastructure spending (about 11% of the US total). Not sure of the underlying formula, but just splitting this based on population would imply about $3 billion more for California. Of course this is far from a final figure, but it looks like the legislature may need to cut more from the state budget than I originally thought. This graph shows the % change in employment over the previous 12 months from 1991 through November. California is the red line, and the U.S. is the blue line. 1. It is interesting to note how parallel CA has been to the U.S. path during this decade compared to the 1990s. 2. 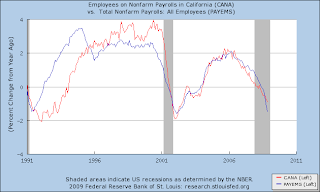 The blue line is now below the red line, as the rest of the U.S. is now losing jobs faster than California. As the state releases new employment figures Friday, it will be interesting to see if this pattern holds. Peter Gleick of the Pacific Institute in the Sacramento Bee. Gleick makes a number of good points. I think the canal is most likely a bad idea, but I completely agree with him that one can't even make a good assessment until there is a clear proposal to assess. For example, it isn't at all clear how much water can be exported through a canal in an environmentally sound manner. It seems to me that for the cost-benefit to pencil out, exports would have to be high. Gleick also makes a good point that the rush to build a canal is distracting from discussion and implementation of other important recommendations to come from the process, such as investment in conservation. Not that things are all that great to the north in Stockton and Sacramento, but it seems like there has been a disproportionate amount of negative business headlines from the South Valley lately. Gottschalks bankruptcy hits the Fresno area hard since both their HQ and distribution was based in this area. Pacific Ethanol shuts down its Madera plant rather than the one's in Stockton and southern California. Collapse in milk prices hits a dairy industry with it's greatest concentration in the South Valley. Other commodity price drops (especially oil) and other ag. hits the region hard to. Fresno Falcons hockey goes bust, while their Stockton Thunder rivals are still hanging on. The drought isn't looking good for this region either. For a long while, the commodity boom in ag. and oil was helping the South Valley economy to overcome the housing recession, and their economy was outperforming their inland California neighbors to the north (Mod/Stockton/Sacramento) and south (inland empire). That looks to be changing now. Democrats in Congress make Obama's plan more efficient and effective, by eliminating an expensive and ineffective proposal for a jobs tax credit. A good sign, although Obama's inclusion of this measure slows down the stimulus and is a bad sign that he is thinking too much about politics before he even takes office. In Sacramento, some Democratic leaders will not implement furloughs because they are "unfair." I am not a big fan of furloughs, because I think it is an inefficient way to cut spending. They are murder on employee morale and drive away the most talented and productive workers. Once the downturn is over, the government is as big as ever but less effective. However, I think furloughs are fair. Most people in the private sector are working harder for less income (or not working at all). That's why state revenue is down. It's not the private sector workers fault either, but it's the current reality. San Francisco Chronicle Front Page story on declining milk prices. This is interesting. A few facts to consider while you read it. California is 12% of the human population of the U.S. However, it is home to 20% of the country's dairy cattle, and 22% of the milk supply. The state's cow population and milk production in recent years has been growing significantly faster than it's human population. The CA dairy industry has been growing faster than any other state (although the number of dairy farms is declining as they grow larger). The state leads the nation in alfalfa (heavy water consumption) production to feed those cows. California has terrible air pollution (particularly in dairy country in the south valley) and has just passed AB32 to combat global warming, despite the potential of heavy economic costs. Cows produce a tremendous amount of green house gases. The projects pumping water to those alfalfa fields are the biggest power consumers in the state, and are harming the Delta. I like agriculture and farmers. I eat meat and I drink milk. Agriculture is important to the Valley and I want it to stay that way. However, it is fair to question whether it makes sense for California to be such a huge dairy producer. This industry has grown fast, and the profits of individual dairy farms will improve if the industry shrinks. Part of the profitability problem is that feed costs have increased greatly, and the industry's growth is partly to blame for increasing demand/prices for inputs too. Govt. should not intervene to prevent the shrinking of the herd. Rep. Cardoza's foreclosure plan is described in this Record article. In contrast to earlier plans by the FDIC, Treasury, most modifications done currently by lenders, and proposals to allow bankruptcy judges "cramdown" principal, Cardoza's plan is not limited to those who are currently defaulting, in bankruptcy, etc. This is much more fair. We should not be encouraging and rewarding people for defaulting, and we should do something for people who have continued to live up to their mortgage obligations even when it is challenging and sometimes not in their own best financial interest. It doesn't involve principal reduction, thus I think it will only postpone rather than prevent most foreclosures. In fairness to Cardoza, I'm sure he recognizes the benefits of principal reduction too, and part of the focus on refinancing interest rates is probably practical. An effective principal reduction program has tougher implementation and legal obstacles to overcome. I don't like legislating interest rates on mortgages. This is a housing subsidy that will be very hard to take away once it is in place. From a TNC Q&A in support of the peripheral canal. Nature.org: Why not just stop exporting water from the Delta? Did he really say that? If he had said that it would have too big of an economic impact or was politically impossible I would disagree with him, but at least feel he was being honest. It is well known that the main impact would be to fallow a large amount (but by no means all) of irrigated, desert land in the south valley. Certainly there would be some economic impact (typically exagerrated by canal supporters), but I didn't know until now that this would be bad for the environment. I guess this is one of "California's last great places" you are protecting with your TNC donation. Some interesting comments about Stockton mall retailers faring better than expected this holiday season, along with a few new store openings. Like everywhere else, Stockton is struggling and has its fair share of shopping center vacancies. However, the economy here is not as bad as conventional wisdom predicts for the world's foreclosure capital. We have been predicting it will be the fastest growing market in Northern California over the next 2 years (not that it takes much positive news to earn that distinction these days). Sherwood Mall General Manager Gayle Speare said that despite a "very rugged economy, the stores we have actually have done very well." She was very surprised, she said, but most retailers there hit or exceeded their sales marks over the holidays. Meanwhile, our last forecast predicted Silicon Valley would see the biggest change in fortunes in 2009. They dodged the first half of the recession (dominated by real estate and construction troubles), but the tech sector will be hammered by the steep, broad based, global downturn. Intel's disapointing results made headlines yesterday. For the second time in two months, Santa Clara computer-chip giant Intel on Wednesday lowered its fourth-quarter revenue forecast, saying weakening global demand for semiconductors had cut unexpectedly into its sales. Once upon a time, the The Nature Conservancy and EDF were the only environmental groups I contributed to. The economist in me liked TNCs narrow mission of buying conservation land, and EDF was the most economically savvy of the big environmental groups. Since then, TNCs simple mission to acquire private nature preserves became mired in political advocacy, using public money, insider land deals, and questionable ethics (of course, they got bigger, more influential and richer with the change in mission). Like many others who stopped donating back in 2003, I never came back (not that they miss my modest membership fee). They made public apologies, and created new ethics guidelines in 2004, but I wasn't convinced. To my knowledge, this is the only environmental group ever to have Senate hearings regarding their ethics. If you are unfamiliar with the history, I recommend a series of articles by Stephens and Ottaway in the Washington Post around 2003. This article in today's Sacramento Bee reminds me why I quit. I couldn't disagree more with the conclusion of this article. Taking extra time for debate, consideration, hearings, etc. might win a few extra votes, but I think it can only make the measure less effective. There will be a few "polar bear exhibits" that might not pass the cost-benefit or critical infrastructure list. My guess is that taking more time will lead to more of these (not less) and an even bigger stimulus bill as the economy continues to get worse. The legislation is going to pass. It's how it passes that will determine whether Obama increases or diminishes the political capital he needs for his next set of tasks, which include addressing the country's health care problems and rewiring the nation's energy policy. Back from my first real vacation since moving to California 10 months ago. Tried to ignore the news as much as possible, but noticed a few things. Holiday Sales: The overall decline in holiday sales is no surprise. What is a surprise is that on-line sales declined by as much (or even a little more depending on the data source) as traditional sales. I didn't expect that at all. I wonder if this is a holiday anomaly (people wanted to go out shopping even if they were going to spend less), or a sign that the boom in on-line retail is waning. If there is any hopeful news in this season for shopping centers, I guess this is it. Governor times unpopular announcements: Making controversial or unpopular announcements late on a Friday or before a holiday is the oldest PR trick in the book. The Governor did it twice last week making the $41 billion budget proposal on New Year's Eve and the Delta Vision announcement recommending a peripheral canal without legislative or voter approval on a holiday weekend Friday afternoon - thereby ensuring skimping news reports and reporters inability to contact opponents. Both moves were disapointing, but understandable. Obama stimulus plan changing and faces delays: We need this now, so it is disapointing to see Congress already predicting mid-February for getting it done. This makes it even tougher for state budget makers in CA and elsewhere who won't know the extent of federal help for some time. I am a bit surprised by the extent of corporate tax breaks in this morning's proposal. The details are not as clear as I expected at this point.